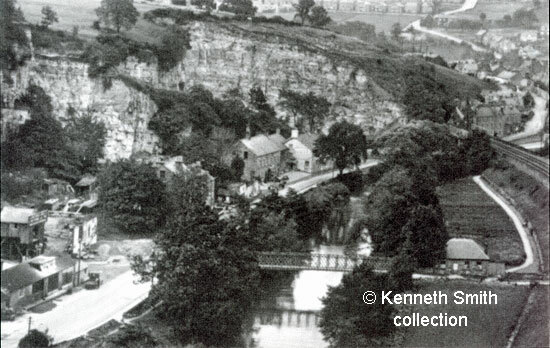 The photograph above shows part of Dale Road, Matlock, taken in the early twentieth century; we can see the Boat House Hotel and the the railway line that used to connect Matlock with London and Manchester. Greatorex's tar boiling works can also be seen quite clearly on the left of the picture in Harvey Dale Quarry; his quarry extended behind several buildings. The quarry behind the Boat House was called Holt Quarry. The hotel seems to have acquired the porch that is still there today, suggesting that this picture is of a slightly later date than the previous image. The iron footbridge over the River Derwent replaced the ferry boat, which was the only means of crossing the river at this point until 1872. However, the box girder bridge in the photographs above and below wasn't the first to be built. In August 1872 the Derby Mercury had optimistically welcomed the erection of a strong new bridge across the Derwent. 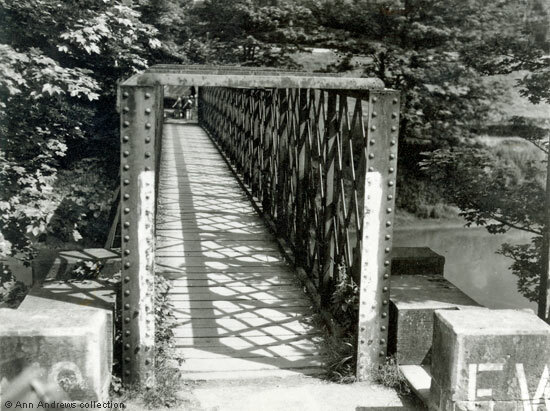 "We are glad to observe that the preliminary massive timber works now spans the river at the junction of Matlock and Harvey Dales, and we expect this useful bridge will soon be completed and opened to facilitate the connection and communication of the many walks, roads, and hamlets which lie on each side of the river". Unfortunately, a timber bridge was not strong enough, no matter how useful it had been deemed to be. In early 1881 heavy rain, followed by the rapid thaw of quite a heavy snowfall caused the Derwent to "rise to a great height"... "The bridge connecting Matlock Dale with the town was swept away by the unusual rush and volume of water". A short while afterwards the Local Board voted for the bridge's immediate replacement. "A new iron suspension bridge supported by a stone pier on either bank, was erected in February, 1882. The floor of the bridge was raised above the known flood level as to render it safe from future inundations". The stone piers were provided free of charge by the Askews and the ironwork cost £240. Top photograph in the collection of and provided by and © Ken Smith. Photograph of the iron bridge © Ann Andrews. Job Greatorex advertised extensively in the trade directories of the time. For example, he can be found in Kelly's Directory 1891 | Kelly's Directory 1895 | Kelly's Directory 1899 | Kelly's Directory 1908 | Kelly's Directory 1912 | Kelly's Directory 1916. "The Derby Mercury", Wednesday, August 7, 1872. "The Derby Mercury", Wednesday, February 16, 1881.